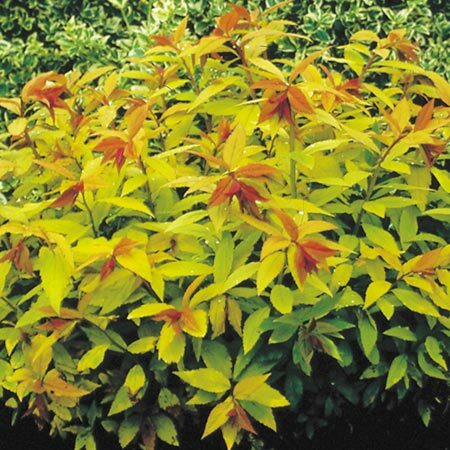 Both the foliage and the flowers make this an interesting and colourful shrub. 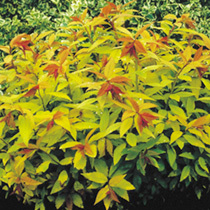 The foliage emerges each spring with a burnished bronze-red flush, but as the leaves mature they turn bright yellow, then luminous green. In mid- and late summer, clusters of dark pink flowers appear, seemingly backlit by the glowing foliage. Compact and easy to grow, this shrub makes an excellent, informal, low hedge, or groundcover plant for a sunny well-drained border. A real winner to brighten up the garden. Flowers July-August. Height 70-80cm (28-32"); spread 70-80cm (28-32"). Supplied in a 2-3 litre pot. Supplied in a 3 litre pot.